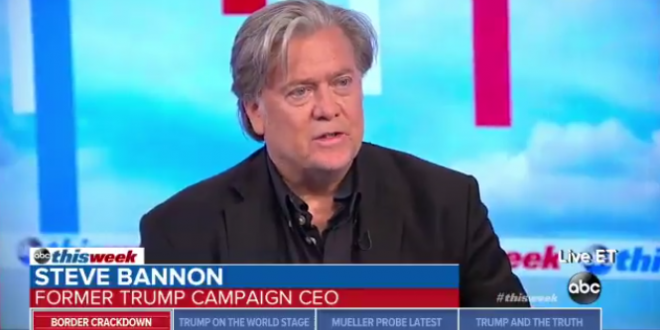 Bannon: Trump Doesn't Need To Justify Separating Migrant Families, The Law Has Zero Tolerance [VIDEO] - Joe.My.God. “It’s zero tolerance. I don’t think you have to justify it. We have a crisis on the Southern border but the elites in the city want to manage situations to bad outcomes. And Donald Trump is not going to do that, he’s just not going to kick the can down the road. He went to a zero tolerance policy. It is a crime to come across illegally and children will get separated. That’s the law and he is enforcing the law. The morality is the law. They are criminals when they come across illegally.” – Steve Bannon, speaking this morning on ABC This Week.